We are starting off towards Moab, but there are a few parks and sites that we want to visit on our way. HWY 15 north again and then HWY 9. This time we take the regular route through Zion. The Park is nice but not overwhelming. We don’t really know what exactly it is that we are not as fascinated about Zion than about other parks and areas, but it could be that there is just too much traffic and no ways to escape. Anyway, we still stop many times to take nice pictures. We definitely still enjoy it. After Zion we head north towards Bryce Canyon. The same road we took coming from Kanab a few days ago. But, then instead of turning into Bryce Canyon we continue the scenic route 12 towards Tropic, Escalante and Boulder. First we see some more hoodoos since we are still close to Bryce Canyon and then it’s more hilly with canyons here and there. The road is mostly on top of the hills and we can a wonderful overview and can look down into the canyons. In Boulder we turn right into Burr Trail Road. A sign says: “No service for next 75 miles” – we are leaving civilization! The first 30 miles are paved and run over a plateau and then through a canyon with huge red cliffs on either side and green trees to the left and right of the road – very impressive and beautiful! Then we enter Capitol Reef National Park from south. The landscape changes rapidly from red to yellowish and white. Soon after entering the park we descend into the Waterpocket Fold. The descend is very steep and the mountains are kind of in a 45 degree angle as if they were folded up. One part/layer is dark red and the other layer is almost white, it looks kind of fake and unreal. The Waterpocket Fold is like a wide river bed, green at the bottom and seemed with hills with almost geometrical patterns of different textures and colors of stone. This has been one of the most fascinating routes on our trip so far – just breathtaking! 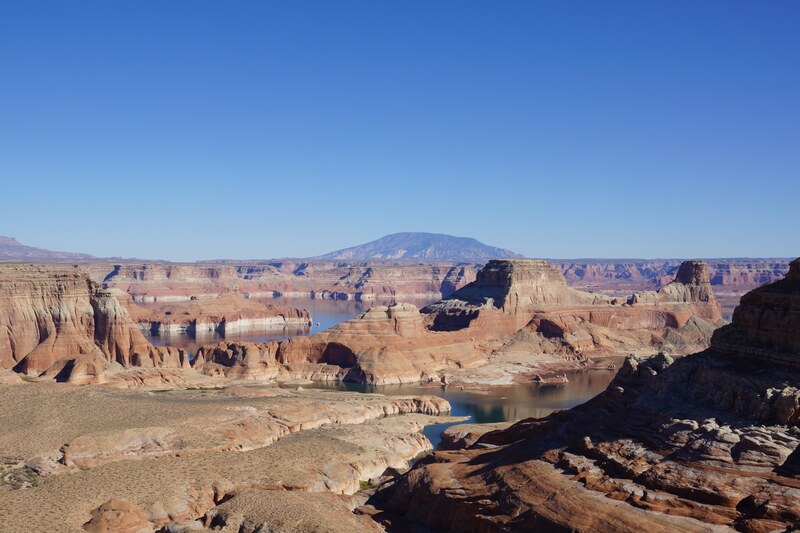 We check that map again and see that there is a road leading south to Bullfrog Marina at Lake Powell, where a ferry boat is making the connection and could save us over 100 miles on our way to Moab. The Navigation system also shows a road going through with reasonable milage to Moab. So we turn and drive south. It’s a gravel road but it is very well maintained and good to drive. Then a turn and a riverbed and from there the road is small, bumpy and from one creek to the next. Confident we still follow the guidance of the map and the navigation system – after 77 miles we hit a paved road again!!! From there it’s another 24 miles to Bullfrog Marina. We stop at the gasoline station and ask when the last ferry boat would be leaving. She says: “now” – but we are still half an hour from the lake! As we are that close to the lake we continue to verify the information and to find out that a room at the Lodge in Bullfrog costs $176 per night! We take a couple pictures of the lake and say goodbye again. After a little more than an hour we arrive in Hanksville. A village with a population of 200 people, one Motel, 2 restaurants and 2 gas stations one of them with a store. The motel is clean and has a room for us for $70. Meanwhile it’s 8:30 pm. It’s been a long day with way over 300 miles. Today we saw a rabbit and a coyote!